One of the most colorful characters of the Wild West, Henry Plummer, allegedly played both sides of the law during his short twenty-seven years. Though for more than a century he was thought to have been guilty of numerous crimes and rightly hanged in Bannack, Montana, today’s historians question whether or not he was truly guilty of the crimes he was accused of. Born in Addison, Maine in 1832, to William Jeremiah and Elizabeth (Handy) Plummer, he was the youngest of seven children. His father, older brother and brother-in-law were all sea captains and Henry was expected to follow in their footsteps. However, the young man was slight of build and consumptive, making the rigors of the sea trade too much for him to handle. When Henry was a teenager, his father died and the family began to struggle financially. 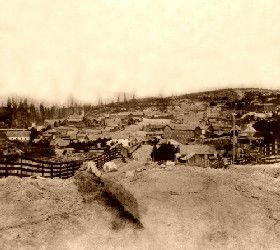 Just two years after the California Gold Rush began; Henry promised his widowed mother that he could help the family by making his fortune in the West. In April, 1852, nineteen-year-old Henry sailed from New York on a mail ship to Aspinwall, Panama, traveled by mule train to Panama City, then boarded another ship for the rest of his journey to California. Twenty-four days after his departure, he arrived in San Francisco. Gaining a job at a bakery, Plummer soon earned enough money to move on to the mining camps of Nevada County, about 150 miles north of San Francisco. About a year after his arrival in California, documents show that he owned a ranch and a mine outside Nevada City, California. Some twelve months later, he traded some of his mining shares for the Empire Bakery in Nevada City. By 1856, the local residents, so impressed by the young man, persuaded him to run for sheriff. At the age of 24, he became marshal of the third largest settlement in California. The young marshal was well liked by the Nevada City citizens and respected for his promptness and boldness in handling his duties. He easily won the re-election in 1857. But, shortly after the election, he killed his first man. At the time, Henry was said to be having an affair with the wife of a miner by the name of John Vedder and when he was confronted by the angry husband, the two competed in a duel, for which, Henry obviously won. Plummer was arrested and tried in a sensational, emotionally-charged case that went twice to the California Supreme Court before he was finally convicted of second degree murder and sentenced to ten years in California’s infamous San Quentin Prison. He began to serve his sentence on February 22, 1859 and local residents quickly petitioned the Governor for a pardon, claiming that Henry had acted in self-defense. Among his comrades behind bars was Cyrus Skinner, serving time for grand larceny, who would later be connected with Plummer again. Plummer served time only until August 16, 1859 when he was released due to his tuberculosis and pressure on the Governor by the petition. After his release, Henry returned to Nevada City, to the bakery and became an avid customer to the many brothels of the settlement. Before long, he was penniless and soon joined a group of bandits intent upon robbing area stage coaches. In one such incident, the stage driver got way with his passengers and cargo, but Plummer was arrested. Standing trial for the attempted robbery, the former sheriff caught a reprieve when he was acquitted due to lack of evidence. But trouble had begun to follow Plummer around and soon he was caught up in a brawl over a “painted lady” with a man by the name of William Riley. When Henry shot the man on October 27, 1861, he was once again arrested. This time he escaped prison by bribing a jailer before he could be tried and fled for Oregon. Along the way, he met another bandit by the name of Jim Mayfield, who had alleged killed the sheriff of a neighboring town. Both were obviously wanted men, and the ex-sheriff sent word to California newspapers that both he and Mayfield had been hanged in Washington. It had the desired effect, curtailing the need for the desperadoes to constantly look over their shoulders for the pursuing posse. In January, 1862, Plummer landed in Lewiston, Idaho with a woman companion and registered at the Luna House. Working in a casino, he soon ran into his old cellmate, Cyrus Skinner and other individuals destined for the gallows in Montana, such as Club Foot George Lane and Bill Bunton. Forming a gang, the like-minded men began to rob the local families of the area mining camps, and especially targeted the gold shipments traveling the roads from the mines. Somewhere along the line, Plummer abandoned his mistress, a woman with three children who had to resort to prostitution to feed herself and family, and finally died an alcoholic, in one of the seedier brothels in town. Plummer began to roam the area between Elk City, Florence and Lewiston. In Orofino, Idaho, he killed a saloon keeper by the name of Patrick Ford. When the saloonkeeper kicked Plummer and some of his friends out of the saloon, Ford then followed them to the stable where he fired upon them. Plummer returned fire and killed Ford. When some of Ford’s friends began to form a lynch mob, Plummer hightailed it out of there and headed east to Montana. By September, 1862, Plummer was beginning to feel the effects of his tuberculosis and wanted to return home. 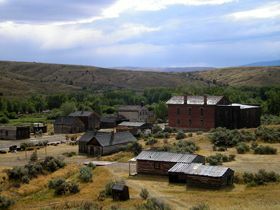 Heading from Idaho across the Bitterroot Mountains, he traveled to Fort Benton with the intention of going back east. Unfortunately, the upper Missouri River at Fort Benton was frozen and closed to Riverboat traffic. Planning to hold over for the winter, Henry went to work as a ranch hand at the Sun River Farm, a government ranch and Indian Agency, in October. Plummer soon became enamored with Indian Agent James Vail’s beautiful sister-in-law, Electa Bryan. Henry and Electa spent about two months together and were quickly engaged to be married. A former cohort of Plummer’s by the name of Jack Cleveland was also vying for Electa’s attention, which incensed Henry. Nevertheless, both men headed to Bannack, Montana, the most recent site of gold rush fever, in January 1863. Hastily built to accommodate the many miners flooding to the area, Bannack was called home to all manner of transient men including Civil War deserters from both sides, river pirates, professional gamblers, outlaws and villains. Lawlessness ran rampant as holdups occurred daily, and killings were just as frequent. Henry soon rounded up another gang, calling themselves the Innocents, and began to relieve the gold-laden travelers from the Montana camps of their valuables. The Innocents grew quickly and became so large that secret handshakes and code words were instituted so one “Innocent” could recognize another. 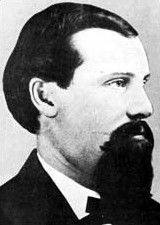 One night while Henry was drinking in Bannack’s Goodrich Saloon, Jack Cleveland, his old nemesis, began to taunt him by making numerous references to Plummer’s outlaw activities. When Henry warned him to stop, Cleveland continued to spout his accusations and Plummer fired a warning shot. Cleveland then pulled his own six-gun, but Henry was faster and soon Cleveland lay on the floor, mortally wounded. fearing that he wouldn’t get a fair trial in what they believed to have been self-defense, they LET HIM LEAVE!!! Doing a school report on Henry Plummer this was very helpfully.